Travelers with disabilities may find it extra difficult to enjoy the beach. Standard wheelchairs stick in the sand, turning a fun day at the beach into a back-breaking trek under the Florida sun. But some tech-savvy engineers created a solution to this beach bummer. 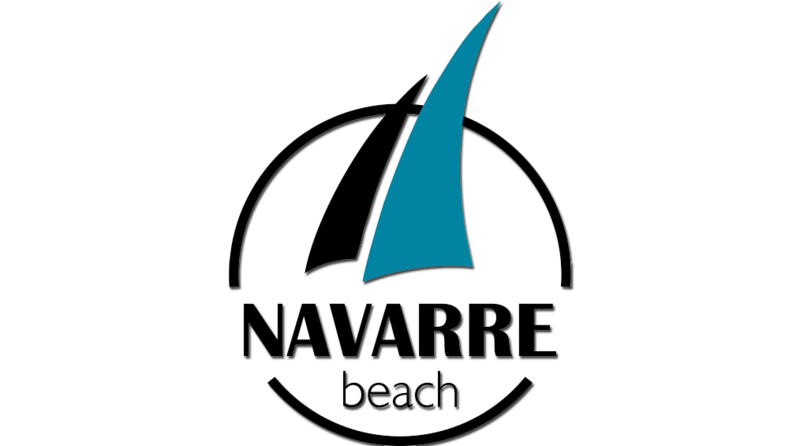 Navarre beach wheelchair rentals can make your trip unforgettable! These special mobility devices are the latest invention to help handicap folks traverse sandy beaches and enjoy their vacation to the fullest. Never heard of a beach wheelchair? You’re not the only one! 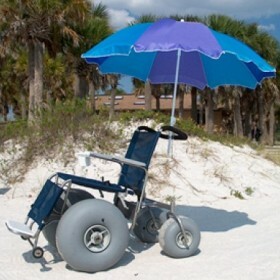 Learn more about Beach Wheelchairs you Never Knew Existed. This Traditional Beach Wheelchair is commonly used on beaches across the Gulf Coast. 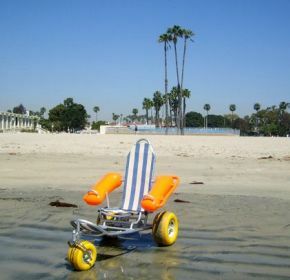 Considered the original beach wheelchair build, this design comes complete with mesh seats, aluminum or pvc frame, and giant balloon tires that roll over sand with ease. This type of beach wheelchair is push-only, and most readily available at select rental agencies, lodging, and public agencies. De-Bug, a local developer of the wheelchair, is headquartered in Pensacola, FL. De-Bug chairs, built with premium materials and a handful of cool add-ons including cup holder and sunshade, are the most popular brand found in the Florida Panhandle. Check rates and availability for this wheelchair online at Traditional Beach Wheelchair. The Mobi-Chair Beach Wheelchair has one feature you won’t find in any other beach wheelchair… it floats! With giant buoys on either armrest and buoyant tires, this chair is made to float. The innovative no-tip seat complete with leg and chest straps makes it safe for individuals with various types of disabilities to enjoy the ocean! While more difficult to push than the traditional beach wheelchair, the Mobi-Chair can still glide over sand with extra-wide rubber pneumatic tires. These chairs are typically for rent only, so check with nearby beach wheelchair dealers for availability. Check rates and availability for this wheelchair online at Floating Beach Wheelchair. 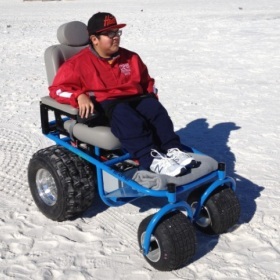 The most highly sought after of all types of beach wheelchairs, the Power Beach Wheelchair is 1/2 wheelchair, 1/2 ATV! Mow through the deepest and softest sand with the help of a powerful motor and easy-to-use joystick. Beach-goers love this type of beach wheelchair because not only does it come with an extra-comfy adjustable seat and heavy-metal frame to support heavy users, but it doesn’t require a pusher! Check rates and availability for this wheelchair online at Power Beach Wheelchair. Ready to rent your own beach wheelchair? Lots of area equipment renters including Destin Wheels offer several types of wheelchairs, beach wheelchairs, and mobility equipment to use during your vacation. 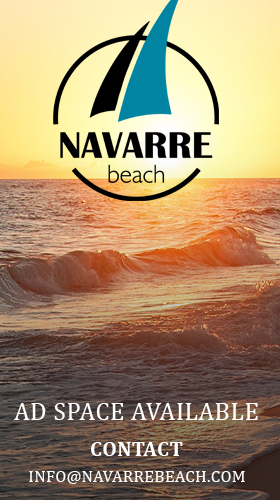 Once you’re mobile, try out one of the awesome Navarre Beach things to do including tours, attractions, and family-friendly activities! May 12,13,14 we are staying at the pearl on Navarre . Hello Trudy, if you’re searching for an electric beach chair, we recommend contacting beach powered mobility at 800-533-1168. for any other kind of wheelchair inquiries including a floating beach wheelchair, or mobility scooter rental, check out the Destin Wheels website at http://destinwheels.com/. We are coming the first week in July. I wanted to see where the handicap beach access where located? She was thinking of renting a beach wheelchair. Hey Crystal, I believe there is a public access near the Navarre Beach Fishing Pier. 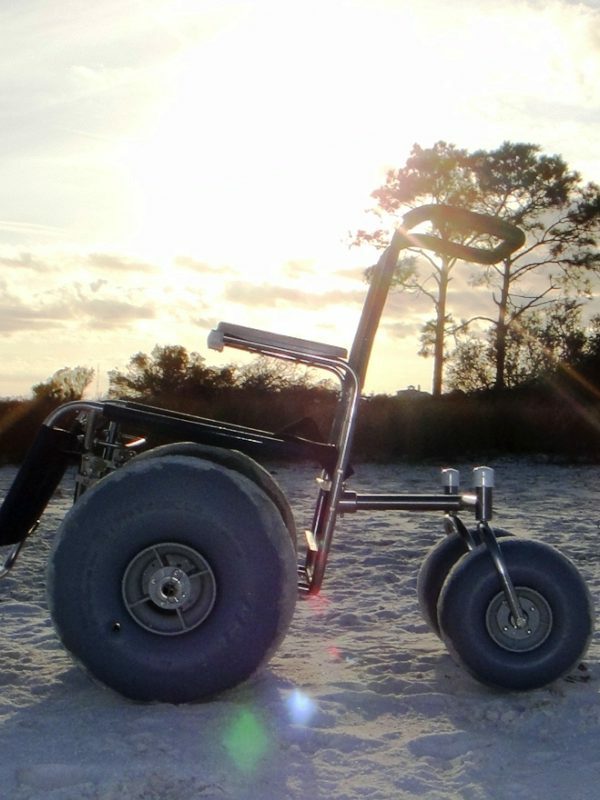 For more information on beach wheelchair access in the area, please contact Destin Wheels, a local wheelchair rental service. Visit their site at destinwheels.com.